Can epoxy coatings be used to cover the asbestos floor tiles in my garage? Yes, you can have epoxy coating applied to seal off the asbestos tiles on your garage floor. 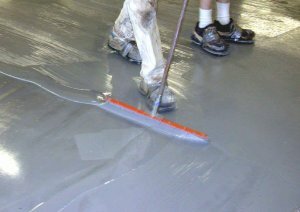 This method of obtaining an epoxy floor will be much more cost-effective than the removal of the tiles, which would have to be done in compliance with asbestos abatement rules. Will all concrete areas in our garage be coated with epoxy? Yes. We can coat all exposed concrete in your garage. What do I do with the contents of our garage while the epoxy coating is done? We recommend the use of a storage container. How long before we can resume use of our garage after the epoxy coating is applied? You can walk on your new garage floor in 24 hours. We recommend that you wait 48 hours before moving items back into your garage. This timing could vary based on temperature and humidity levels. Do not drag items across the new epoxy floor as this might mar the surface of the new garage floor. When can I walk on our new epoxy floor? We recommend waiting 24 hours before walking on the coated surface. When can I bring items back onto the new epoxy floor? We recommend waiting 48 hours before bringing items back into your garage. When can I bring heavy machinery and equipment back into the work area? We recommend waiting 72 hours before you bring heavy machinery and equipment back into your work area. How do I clean the new floor? Epoxy can be cleaned with warm water and household floor cleaner. Most spills will wipe right up. What will remove stubborn stains? Please use a mild abrasive cleaner that does not contain chlorine as chlorine will break down the epoxy. How often should the epoxy flooring be cleaned? Clean as often as necessary. Use a broom to remove dust and dirt. Your new epoxy floor can be washed down with a hose and water. Removing the water from your garage floor is easy with a squeegee.